Tiny Telegrams Postal Telegraph Co. 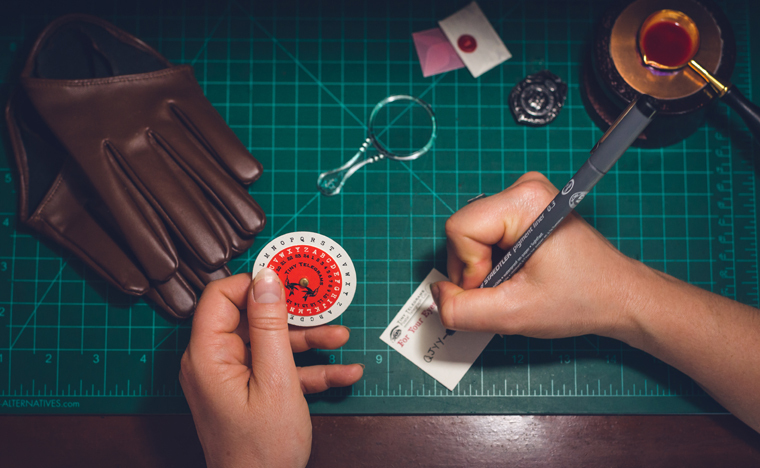 Tiny Telegrams was created out of a love for all things miniature and a nostalgia for a very nerdy childhood obsession with top secret spy kits, books and adventures. Combine that with a desire to use art to help people connect with each other in a world so full of distractions and you have Tiny Telegrams! We believe that just a small token of appreciation can impart a whole lot of love! We hope you will join us on this journey and look forward to playing a part in bringing smiles to faces everywhere. All of the telegram forms, packaging designs and logos are hand designed using carefully curated fonts and a blend of vintage woodcuts and freehand designs. They are sent to a local printer for offset printing (you don't want us using our crappy all-in-one inkjet, trust us on that), then hand cut, folded and sorted here in our Tiny Telegraph office ready to be handwritten in tiny printing and shipped directly to your loved ones! My name is Rachel Hillberg and I'm an artist and adventurer. For me, making art is about finding beauty in the mundane, and fostering connections with others. I am inspired by miniatures, nature, sociology and a strong sense of mystery. When I was little, I wanted to be (or thought myself to be) a kid detective. While this ambition was never realized, I keep that part of me alive by bringing that same sense of mischief and wonderment to my art, whether I'm hand binding a book, designing a logo or illustration or creating and assembling a tiny telegram or cryptogram from scratch. I am fueled by coffee, podcasts and short stories and have an unhealthy obsession with Uniball pens and Mirado Black Warrior pencils. When I am not designing, crafting or art...ing? I can usually be found gardening with my husband, playing ukulele with friends at music night, riding my bicycle, or playing fetch with our two cats. So, What is a Tiny Telegram Anyway? You select your telegram style from our shop & submit the message you'd like to transmit. Then give us the mailing info for your intended recipient & we will handwrite your message & send it directly to your loved one. Your 1 x 1 1/2 inch telegram will be hand cut & hand-transcribed in very tiny writing. 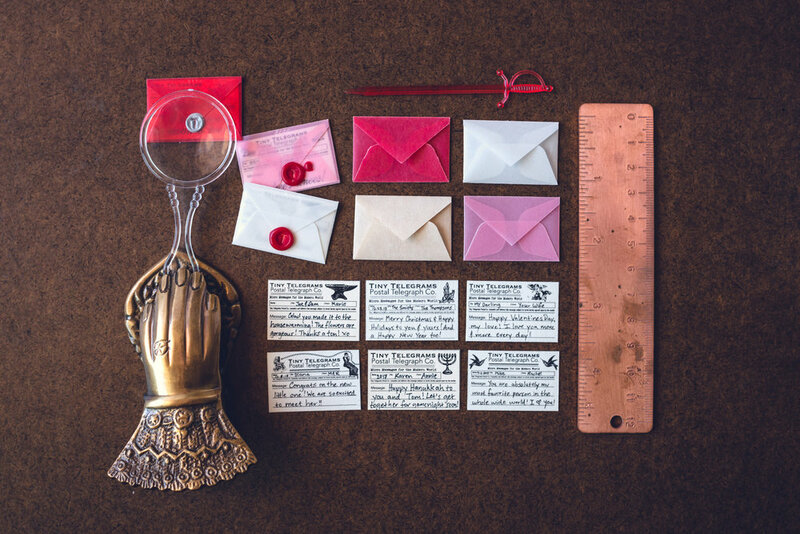 The 'gram is sealed in a translucent vellum envelope with red wax, packaged in a 4 inch square novelty tin box with a mini magnifier, & cocktail sword "letter opener" on a kraft cardstock background. Then the tin itself is carefully wrapped in a kraft and butcher's twine sleeve & held together by a wax seal that reads "For You." Want to know more? Check out our F.A.Q.